The shimmering colours visible in this NASA/ESA Hubble Space Telescope image show off the remarkable complexity of the Twin Jet Nebula. The new image highlights the nebula’s shells and its knots of expanding gas in striking detail. Two iridescent lobes of material stretch outwards from a central star system. Within these lobes two huge jets of gas are streaming from the star system at speeds in excess of one million kilometres per hour. 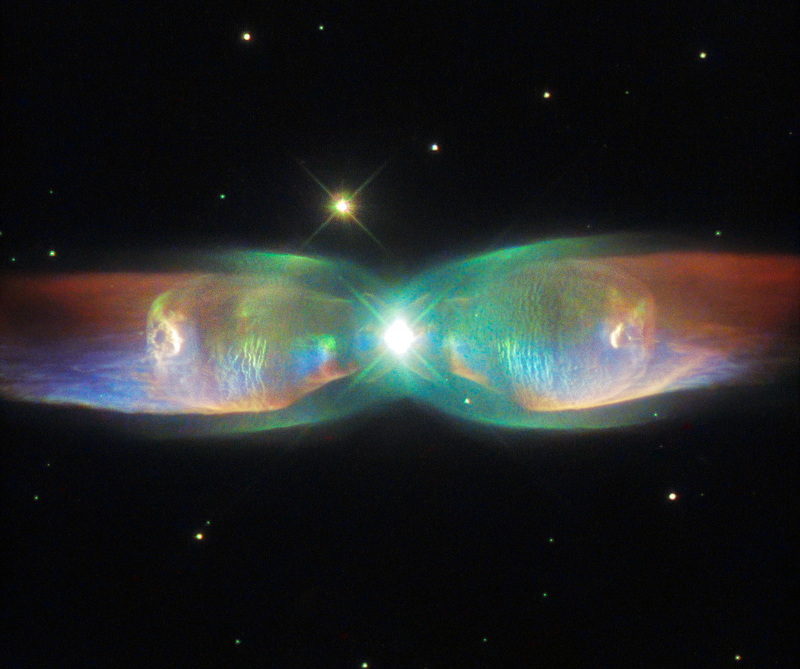 The characteristic shape of the wings of the Twin Jet Nebula is most likely caused by the motion of the two central stars around each other. It is believed that a white dwarf orbits its partner star and thus the ejected gas from the dying star is pulled into two lobes rather than expanding as a uniform sphere. However, astronomers are still debating whether all bipolar nebulae are created by binary stars. Meanwhile the nebula’s wings are still growing and, by measuring their expansion, astronomers have calculated that the nebula was created only 1200 years ago. Within the wings, starting from the star system and extending horizontally outwards like veins are two faint blue patches. Although these may seem subtle in comparison to the nebula’s rainbow colours, these are actually violent twin jets streaming out into space, at speeds in excess of one million kilometres per hour. This is a phenomenon that is another consequence of the binary system at the heart of the nebula. These jets slowly change their orientation, precessing across the lobes as they are pulled by the wayward gravity of the binary system. The two stars at the heart of the nebula circle one another roughly every 100 years. This rotation not only creates the wings of the butterfly and the two jets, it also allows the white dwarf to strip gas from its larger companion, which then forms a large disc of material around the stars, extending out as far as 15 times the orbit of Pluto! Even though this disc is of incredible size, it is much too small to be seen on the image taken by Hubble.